Presented by DallasChocolate.org, the Dallas Chocolate Festival is an annual event designed to raise awareness and appreciation for the amazing work of local and national fine chocolate craftsmen. This year we’re filling up theAddison Conference Centre on Saturday, September 13th, 2014, with more chocolatiers and chocolate makers than ever before. 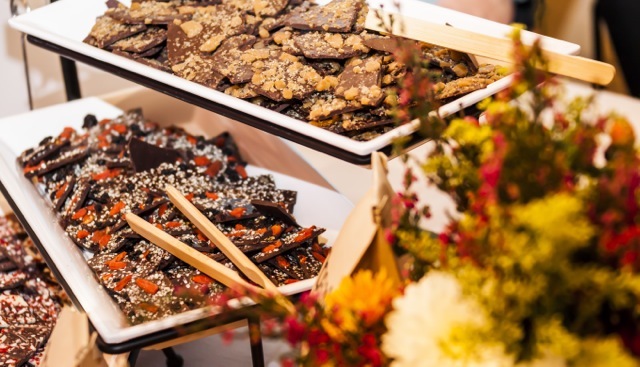 Attendees will enjoy sampling from the wall-to-wall chocolate from local and national artisans. Kids can even enjoy making their own chocolate treats at a special interactive kids’ table. TICKETS TO THIS EVENT WILL SELL OUT IN ADVANCE!! BE SURE TO GET YOUR TICKETS TODAY!! Chocolate makers scheduled to appear at the event include Art Pollard (Amano Artisan Chocolate, Utah); Ben Rasmussen (Potomac Chocolate, Virginia); Kristen Hard (Cacao Atlanta Chocolate Company); Scott Moore, Jr. (Tejas Chocolate, Houston); and Santiago Peralta (Pacari Chocolate, Ecuador). Tickets for the Festival can be purchased for entry at three different times. Pick whichever time is most convenient for you — the chocolate vendors will be the same throughout the day. Also included with a ticket purchase is a full day of classes and demonstrations that take place in an adjoining room of the Addison Conference Centre. Classes are great for beginners or dedicated chocolate fanatics. Adrienne Newman (Madame Cocoa) will return as the event’s mistress of ceremonies. While all classes are included with a ticket purchase, space is limited and is on a first come, first seated basis. Barry Callebaut USA; Amano Artisan Chocolate; Valrhona; Tejas Chocolate; Taza Chocolate; Pacari Chocolate; Chocolates El Rey; Potomac Chocolate; Cacao Atlanta Chocolate Company; Sublime Chocolate; Chocolate Secrets; Wiseman House Chocolates; CocoAndré Chocolatier; Dr. Sue’s Chocolate; Nib Chocolates; Toffee Treats; Bark Chocolate; Dude, Sweet Chocolate; Goodies Texas; Haute Sweets Patisserie; Dallas Caramel Company; Steel City Pops; Tarrant County College; Collin College; Elegantly Chocolate; Spoon Bar and Kitchen/Knife; The Mansion; JK Chocolate, Kiskadee Chocolate; Srsly Chocolate; ChocoSutra; and more! A Full Day of Classes and Demos included too! See the schedule. Sign up for the Dallas Chocolate Workshops that take place the day after the Dallas Chocolate Festival. Traveling to Dallas for the Chocolate Events? Stay at the InterContinental Dallas. A special package is available in partnership with the InterContinental Dallas hotel. The special rate for a king deluxe or deluxe double room includes breakfast buffet for two adults and VIP admissions to the Dallas Chocolate Festival for two adults as well as an exclusive chocolate amenity in your room nightly. The Saturday night rate which includes the VIP admissions (a $130 value!) is $229 and additional nights are $99. A king bed executive suite is also available. The InterContinental Dallas is walking distance from the Dallas Chocolate Festival. While every effort is made to confirm all details, please note that participants and events are subject to change. For more information keep watching this website or our Facebook page. Tickets are non-refundable.